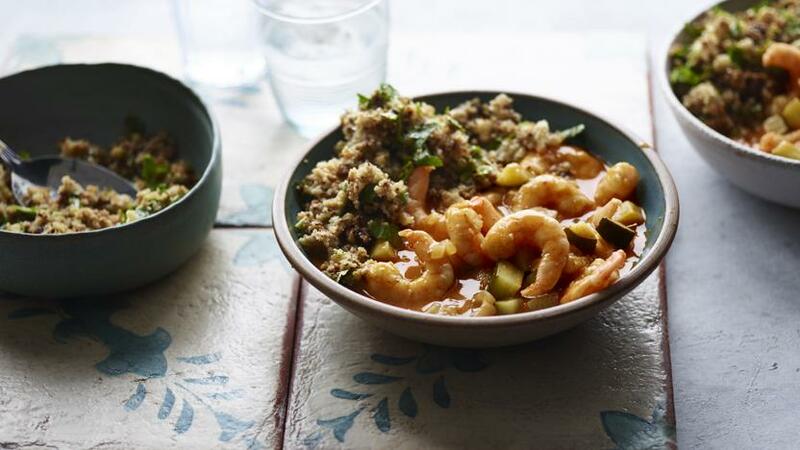 Make this fragrant and healthy coconut prawn curry with a low-carb and aromatic cauliflower ‘rice’ pilau in just half an hour. Each serving provides 281 kcal, 27g protein, 16g carbohydrates (of which 11g sugars), 11g fat (of which 4g saturates), 6g fibre and 2.2g salt. With a GI of 45 this meal is high protein, low GI. Heat the oil in a large frying pan. Add the onion and garlic and cook over a medium heat for 2–3 minutes, or until softened. Add the curry paste and fry for 30 seconds. Add the tomato purée, stock, coconut milk and courgette and simmer for 10 minutes. Add the prawns and cook for 4–5 minutes, or until pink and cooked through. Season. Meanwhile, to make the pilau, pulse the cauliflower in a food processor until the size of rice. Place in a large, heatproof bowl, cover with cling film, then pierce and microwave on high for 6–8 minutes. Heat the oil in a wide frying pan over a medium heat. Fry the pilau seasoning and cauliflower ‘rice’ for 6–7 minutes, or until piping hot. Remove from the heat and stir in the coriander. Serve the curry with the 'rice'.